• Advances in optical coherence tomography (OCT) technology have allowed moving structures in the eye to be selectively isolated, thus allowing us to visualize the retinal vasculature three-dimensionally with unprecedented detail. • OCT angiography (OCT-A) may have applications in both neovascular and non-neovascular age-related macular degeneration. In the former, as a potential tool to monitor response to treatment over time, while in the latter, to study the choriocapillaris and other vascular structures believed to be important in the pathogenesis of disease. • OCT-A is still a new and evolving field with several limitations that are not yet fully characterized; ongoing advances in the technology as well as carefully designed prospective clinical trials will be critical to best define its optimal role and use. Optical coherence tomography angiography (OCT-A) noninvasively images blood vessels in vivo with high resolution, and in 3 dimensions, thus giving the opportunity to qualitatively and quantitatively analyze characteristics of physiologic and pathologic blood vessels at different layers of the retina and choroid. In age-related macular degeneration (AMD), the reference standard imaging methods for diagnosis, treatment response monitoring, and pharmaceutical development are OCT, fluorescein and indocyanine green angiography (FA and ICGA), and fundus autofluorescence (FAF) imaging. In neovascular AMD, both OCT and FA/ICGA are used to diagnose and monitor disease.3 Neither of these methods, however, allow us to fully visualize the structural details of the pathologic blood vessels underlying the disease, nor their response to treatment, particularly to agents targeting VEGF. 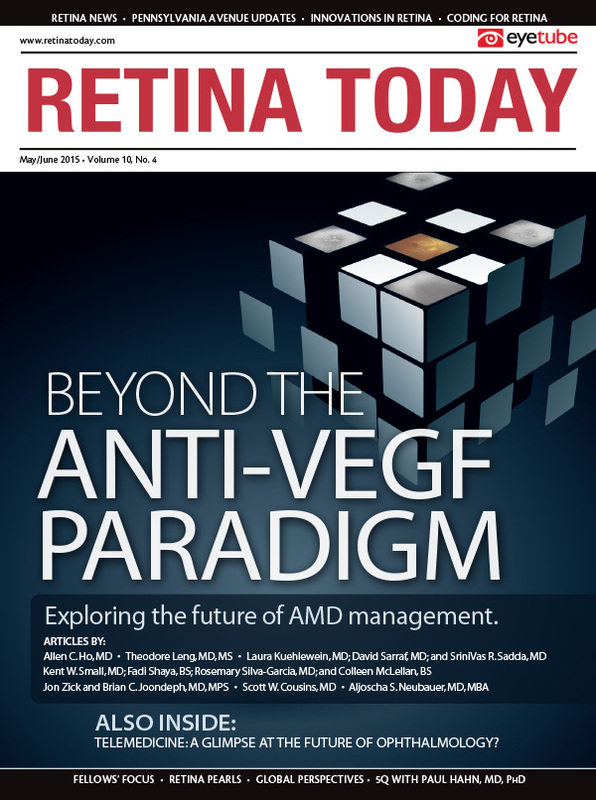 In non-neovascular (dry) AMD, the extent and progression of the disease (atrophy of the retina and retinal pigment epithelium) can be monitored with OCT and FAF. Visualization of alterations of the choriocapillaris and choroid, which are thought to be important structures in the pathogenesis of dry AMD, is limited with use of FA/ICGA. Automated segmentation algorithms can be adjusted to best visualize a membrane according to its location and/or type.5 The vascular membrane can be characterized by its size, morphology or shape, component blood vessel dimensions (such as caliber), presence of a choroidal flow void signal, and likely many more characteristics. Quantitative analyses can also be performed. Figure 1. OCT-A en face images of neovascular membranes in AMD in different patients using different devices: RTVue XR Avanti with AngioVue (A; Optovue); DRI OCT-1 Atlantis (B; Topcon). Figure 2. OCT-A en face images of the choriocapillaris/choroid in different patients with GA in AMD using different devices. RTVue XR Avanti with AngioVue (A); DRI OCT-1 Atlantis (B). Imaging neovascular membranes with OCT-A has several limitations. First, the image quality decreases in patients with poor fixation and/or poor visual acuity, resulting in noisy images with potentially significant motion artifacts. This decreases the likelihood of detecting pathological lesions especially those that are small or have slow blood flow. The automated segmentation in these scans can be challenging because of the difficulty in accurately aligning the target layer. Projection artifact may also limit accurate evaluation as blood vessels from different layers may be displayed on the same slab image. Finally, the image and segmentation quality can hamper the assessment of longitudinal changes in a membrane, as can changes in structures adjacent to the membrane that cause decreased or increased transmission. In good quality scans, OCT-A can reveal the arborization of the vascular network within the membrane—a feature that is generally not visible on FA due to obscuration by leakage and by the overlying retinal pigment epithelium (for type 1 membranes). Visualizing the microarchitecture of the CNV membrane itself offers the prospect to evaluate new parameters that may provide additional insights into differential responses to therapy. For example, lesions composed of a greater proportion of larger, more mature vessels may be less responsive to anti-VEGF therapy. OCT-A offers an opportunity to study the choriocapillaris and the choroid (Figure 2).9 Studies using panoramic stitched OCT angiograms of the choriocapillaris have shown vascular structures consistent with the architectural morphology established by histologic and electron micrograph studies.10 Although it is true that visualization of the choriocapillaris (and especially deeper layers of the choroid) may be affected by the loss of signal with depth in spectral-domain OCT-A devices, this limitation may be addressed in the future by swept-source OCT instruments. Another limitation of OCT-A for choroidal imaging is projection artifacts of large retinal vessels in the axial direction onto deeper levels. Despite these limitations, abnormalities of the choriocapillaris can be observed in eyes with atrophic AMD. Fujimoto and colleagues have demonstrated a loss of choriocapillaris in the bed of atrophy in eyes with geographic atrophy using OCT-A and have also demonstrated a relative reduction of choriocapillaris density in the junctional zone surrounding the bed of atrophy.11 Staurenghi and colleagues have demonstrated that choriocapillaris loss in the bed of atrophy may be even more severe in Stargardt disease than in AMD, possibly explaining the phenomenon of dark atrophy on late phase ICGA in patients with Stargardt disease.12 Studies of the choriocapillaris in AMD and related disorders may provide new insights into the pathogenesis of these diseases and may offer new targets and biomarkers for future therapeutics. OCT-A is a new imaging modality that provides the opportunity for noninvasive characterization and quantification of the microvasculature in neovascular and non-neovascular AMD. It can sometimes be challenging, however, to distinguish between physiologic and pathological blood vessels on OCT-A, and OCT-A cannot detect leakage, staining, or pooling. Although OCT-A has many advantages, including rapid and noninvasive acquisition of images, depth resolution, and excellent microvascular resolution, it also has several limitations. Drawbacks include motion and projection artifact, inability to visualize slow flow neovascular lesions (e.g. low flow lesions such as polyps or very small blood vessels such as type 3 neovascularization), and segmentation errors. Quantitative measurements are thus far limited to area rather than volume. The eventual capability for 3-D display and analysis of vessel structure should allow the depiction of characteristics of lesions and tissues more accurately. Laura Kuehlewein, MD, is an international research fellow at the Doheny Eye Institute and the Department of Ophthalmology, David Geffen School of Medicine at UCLA, Los Angeles, California. She has no financial disclosures to report. Dr. Kuehlewein may be reached at lkuehlewein@doheny.org. SriniVas Sadda, MD, is a professor of ophthalmology at the Doheny Eye Institute and the Department of Ophthalmology, David Geffen School of Medicine at UCLA, Los Angeles, California. He serves as a consultant and receives research support from Allergan, Carl Zeiss Meditec, Genentech, and Optos; he is also a consultant to Alcon, Iconic, and Novartis. Dr. Sadda may be reached at ssadda@doheny.org. David Sarraf, MD, is a clinical professor of ophthalmology at the Stein Eye Institute, David Geffen School of Medicine at UCLA, Los Angeles, California. He receives research support from Genentech, Regeneron, and Optovue. Dr. Sarraf may be reached at dsarraf@ucla.edu. 1. An L, Li P, Lan G, Malchow D, Wang RK. High-resolution 1050 nm spectral domain retinal optical coherence tomography at 120 kHz A-scan rate with 6.1 mm imaging depth. Biomed Opt Express. 2013;4(2):245-259. 2. Jia Y, Tan O, Tokayer J, et al. Split-spectrum amplitude-decorrelation angiography with optical coherence tomography. Opt Express. 2012;20(4):4710-4725. 3. Castillo MM, Mowatt G, Elders A, et al. Optical coherence tomography for the monitoring of neovascular age-related macular degeneration: a systematic review. Ophthalmology. 2015;122(2):399-406. 4. Jia Y, Bailey ST, Wilson DJ, et al. Quantitative optical coherence tomography angiography of choroidal neovascularization in age-related macular degeneration. Ophthalmology. 2014;121(7):1435-1444. 5. Jung JJ, Chen CY, Mrejen S, et al. The incidence of neovascular subtypes in newly diagnosed neovascular age-related macular degeneration. Am J Ophthalmol. 2014;158(4):769-779. 6. Biesemeier A, Taubitz T, Julien S, et al. Choriocapillaris breakdown precedes retinal degeneration in age-related macular degeneration. Neurobiol Aging. 2014;35(11):2562-2573. 7. Bhutto I, Lutty G. Understanding age-related macular degeneration (AMD): relationships between the photoreceptor/retinal pigment epithelium/Bruch’s membrane/choriocapillaris complex. Mol Aspects Med. 2012;33(4):295-317. 8. Lindner M, Bezatis A, Czauderna J, et al. Choroidal thickness in geographic atrophy secondary to age-related macular degeneration. Invest Ophthalmol Vis Sci. 2015;56(2):875-882. 9. Kim DY, Fingler J, Zawadzki RJ, et al. Optical imaging of the chorioretinal vasculature in the living human eye. Proc Natl Acad Sci U S A. 2013;110(35):14354-14359. 10. Choi W, Mohler KJ, Potsaid B, et al. Choriocapillaris and choroidal microvasculature imaging with ultrahigh speed OCT angiography. PLoS One. 2013;8(12):e81499. 11. Moult E, Choi W, Waheed NK, et al. Ultrahigh-speed swept-source OCT angiography in exudative AMD. Ophthalmic Surg Lasers Imaging Retina. 2014;45(6):496-505. 12. Giani A, Pellegrini M, Carini E, Peroglio Deiro A, Bottoni F, Staurenghi G. The dark atrophy with indocyanine green angiography in Stargardt disease. Invest Ophthalmol Vis Sci. 2012;53(7):3999-4004.